At Auburn Chiropractic Clinic, Dr. Tyler Chalfant is trained and utilizes the most advanced technology in the field. He uses the Insight Subluxation Station which is the most precise technology to evaluate a spinal condition. The Insight is a series of five exams that looks at paraspinal functioning, EMG, ROM, Algometry and Heart Rate variability. Using this equipment he can determine the patient's Neurospinal Functional Index number to track progress and determine optimal health. We offer the choice of manual adjustments or with the ProAdjuster. 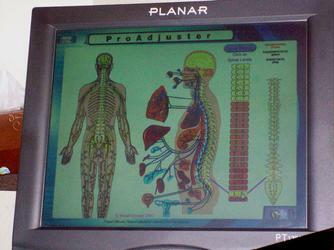 The ProAdjuster can help the doctor determine whether the spines motion is too stiff or rigid. The spine should not be too stiff (fixated). However, instead of only utilizing the doctor's hands and judgment as to what areas are stiff or rigid, the ProAdjuster measures precise levels of function. Therefore, the ProAdjuster can help the doctor isolate a problem faster and more accurately than manual procedures alone. Patients sit upright in a slightly forward posture with their face cradled gently on a padded cushion. The amount of force (pressure) that the ProAdjuster uses to make an adjustment of your spine is about equivalent to the tapping of your fingers on a table. The ProAdjuster utilizes a precise oscillating force with uninterrupted motion. It is able to increase the mobility of the spinal segments by reducing or eliminating the fixations. Like a woodpecker tapping in an oscillating fashion on a tree; the ProAdjuster taps in much the same way but uses soft tips that are comfortable to the human body. The Webster Technique is a specific chiropractic analysis and adjustment which reduces nerve system stress, improves pelvic muscle and ligament function reducing torsion to the uterus and potential intrauterine constraint allowing the baby to get into the best possible position for birth. Dr. Tyler Chalfant performs bi monthly educational classes that are complimentary to his patients and their families. The classes cover spinal health, proper nutrition, movement guidelines and address thought patterns to encompass the whole body for optimal mind, body and spiritual health. He is able to simplify the complexities of the body in a fun, relaxed way that everyone can understand. The class is very interactive and he loves to answer questions about health and wellness. His mission is to teach each person to be healthy, happy, radiant and energized in their own body. Please view the calendar for the next available class.